Schofield Barracks' Sergeant Smith Theater, an Art Deco masterpiece that opened in 1932 and has been showing films ever since. Entertaining the troops with the latest from Hollywood actually came in second place to athletics for many years. Recreation facilities were largely devoted to gymnasiums and playing fields. Even the small arenas were primarily for "smokers," or boxing matches. Military theaters were often coupled with gyms and lecture facilities, with a stage for musical performances and lectures. Even today, all base movie theaters are required to pull double duty, acting as lecture halls in the daytime. The Army led the way with its base theater at Schofield Barracks, open for business in 1932 and now called Sergeant Smith Theater, after Medal of Honor recipient Elmelindo Smith, KIA Vietnam 1967. "It has a strong art deco design style, typical of the period, and it's on the National Register" of Historic Places, said Army architecture historian Ken Hays. "Schofield is a long way from town, and soldiers didn't have cars to get there. So it was decided to bring entertainment to them." When the U.S. fleet moved to Pearl Harbor in 1939, along with a host of civilian workers, the Navy realized it also had to get into the theater business. "During the 1930s and '40s, movie houses really came of age for conveying information and the promotion of culture," explained Navy architecture historian Jeff Dodge. "They were very important to Hawaii's various communities - all plantations had movie houses and downtown Honolulu and Waikiki had great theaters. Architect Vladimir Ossipoff thought one of the greatest pieces of Hawaii architecture was actually the Waikiki Theatre, a true integration of art, architecture and lush Hawaii landscape with ponds and fountains." Military theaters often had humbler origins. A small boxing arena on the submarine base, where open-air films had been shown as early as 1921, was the first Navy facility fully converted into a movie house. 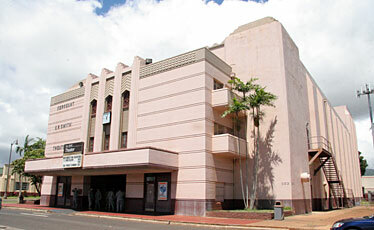 Today, "Sharkey Theater" and Schofield's Sergeant Smith Theater are still used as movie houses, along with the more recently built Hickam Memorial Theater and Kaneohe's K-Bay Theater. Because of Hawaii's mild weather, "open-air theaters and outdoor pavilions became very popular," said Hays. "They're all gone now, but every little military neighborhood had at least one. And they also had live performances. One of the best known was at Fort DeRussy, where folks like Bob Hope and Irving Berlin performed." "This was actually the cheapest entertainment option available," said Dodge. "And nowhere else can an outdoor theater work so well as in Hawaii." Battleships such as USS Arizona had projection booths permanently attached to the decks for open-air movies as well, generally under the mighty gun turrets, with films projected on bulkheads and rigged screens. Possibly the most isolated military theater in the islands was at Kilauea Military Camp, inside Hawaii Volcanoes National Park, perched on the rim of the caldera. Built in 1925 as a Navy barracks, it was converted into a joint-services, 280-seat movie theater in the mid-'30s, continuing to screen films until the mid-'70s. Likely the only military theater in the world that admitted civilians, the site is now used for live performances by the Volcano Art Center. There were dozens more, often open-air sites on isolated bases like Barking Sands and Lualualei, catering to the movie-mad hunger of GIs stationed in the islands - millions of soldiers and sailors during the war. Unlike the more glamorous historic hangar and headquarters facilities, these theaters are largely forgotten. "The history of the military theaters is also a history of the military community," said Hays. "There's a strong pride in Army history at posts like Schofield, and the theaters have served generations of families. They provide a sense of stability. "Military architecture these days is more generic, and today no one would build theaters as beautiful as those at Schofield Barracks or Fort Shafter." "Even today, the remaining on-base theaters provide personnel and their families a nice, inexpensive entertainment option," Dodge said. "They also promote a stronger military sense of community."